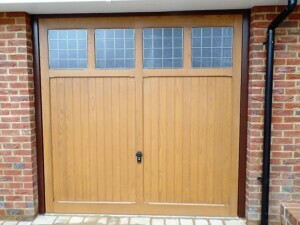 The ‘Costwold’ is a new design door yet to be added to The Corporate Door Company (CDC) brochure. This garage door is available in both single and double tall versions and can be produced in a range of wood tones and colours. The ‘Costwold’ comes with perspex windows with various glazing options available. This recently installed example shows a door with stippled perspex windows with square leading.